HFT 367, fleet number 267: A Weymann H44/33F bodied Daimler Fleetline CRG6LX. One of 35 delivered to Percy Main between 1963 & 68. 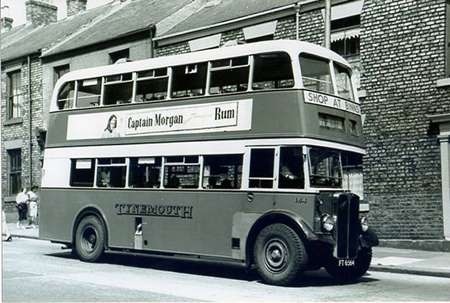 The location is the Gibraltar Rock Public House ‘reflected in the windscreen’ this is at the end of Front Street Tynemouth, and was the terminus of the service 11 to Newcastle, a route shared with Newcastle Corporation. 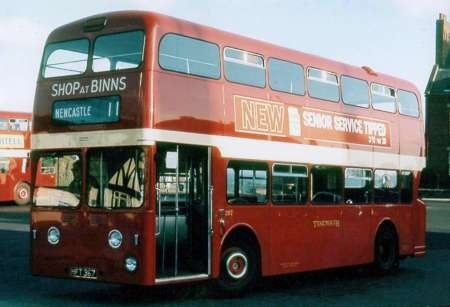 The first PDR1/1 Leyland Atlantean at Percy Main entered service in 1960, and by 1962, they had 22. The first nine, CFT 636/644, 236/244, had H44/34F Weymann bodies; the remainder were all H44/34F Roe bodies. DFT 245/249; 245/249 in 1960. FFT 756/761; 256/261 followed in 1962. 236-254 & 5 all carried the Wakefields name. Percy Main had some very punishing and demanding routes, and despite the best efforts of its maintenance staff, the reliability of the early Atlantean’s was always suspect. It’ s been mentioned before on this site, about the amount of freedom NGT allowed its subsidiaries with vehicle choice and specification. By 1963, Percy Main had lost patience with the PDR1/1, and the roomer mill has it that the first choice would have been front entrance Renown’s or PD3’s. Perhaps mindful of the onset of OPO, Northern thought this a step too far, and would not allow it, however, they did allow Percy Main to switch to the CRG6LX Daimler Fleetline. Nevertheless, it would be a further twelve years before the next new Leyland D/D’s arrived at Percy Main, and they were the 1974 Park Royal bodied Leyland AN68. By that time, it was NBC and you took what you were given with no say in the matter. Ironic really, post NBC six Renown’s were transferred to Percy Main from East Yorkshire. The first batch of Fleetlines arrived in 1963, they were HFT 366/375; 266/275, and had H44/33F Weymann bodies. Outwardly, apart from different wheel trims and the absence of badges, they were more or less identical in appearance to the first Atlantean’s. JFT 276/280; 276/280 arrived in 1964, they were H44/32F Weymann bodies, rather than a conventional staircase with two right angles; they had a full sweep descending forwards. I thought this potentially dangerous, and indeed there were several mishaps, especially if for whatever reason the brakes were applied rather harshly when someone was on the staircase. The remainder were Alexander bodied, AFT 783/789C; 283/289 in 1965: DFT 290/292E; 290/292 in 1967; all H44/32F bodies, and EFT 693/702F, 293/302 in 1968, they were H44/33F bodies. As far as I can remember, 283/289 had air operated doors and windscreen wipers, and the remainder were electric, but that apart they were all more or less the same. I left Percy Main in 1975 to join Armstrong Galley, so my experience of the AN68 is limited, and it would be inappropriate of me to comment on them. However, from my own point of view, the Alexander bodied Daimler Fleetline was the best rear engine double deck bus I have ever driven, the Atlantean may have had a greater top speed, but what the Daimler lacked in speed, it more that made up for at the bottom end. They had power to spare, even with a full load; they were never pushed and could easily keep pace with the traffic we had to contend with. The earlier PD2&3 Leyland’s outlived the first Atlantean’s, as for breakdowns, I can count on one hand with figures to spare the amount of times I broke down with a Fleetline, I lost count with the Atlantean. Ronnie mentions the AEC Renowns that cmd in NBC days. As he says came from East Yorkshire who received a number if Fleetlines from Tynemouth in exchange. This Fleetline looks neither full height nor low height. Were these built to an intermediate height of around 14ft? Chris, I don’t know the exact height, but if you refer to my gallery of Newcastle bus stations, in the Haymarket section, there is a photo of one of these alongside a United Bristol FLF Lodekka, and they seem to be about the same, but camera angles can be deceptive. 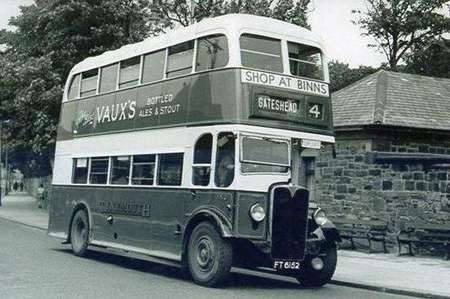 Thanks for a marvellous photgraph of one of my favourite buses in a great location.The photo highlights the excellent stanard of maintenance of the Tynemouth and District fleet in the 1960s! gleaming paintwork! Manchester Corporation had many Fleetlines and PDR1/2 type Atlanteans with Metro-Cammell bodywork similar to this, (but mostly with curved windscreens) with a height of (if I remember rightly) 14ft and half an inch, i.e. between the normal highbridge and lowbridge heights. These also had a modified staircase to Manchester’s own design. The bottom few steps were at an angle of 45 degrees to the length of the bus. It was claimed that this would "aim" descending passengers to the front of the platform, avoiding the bottleneck which could sometimes occur at the bottom of the stairs. When new these buses also had a substantial handrail on the platform which was supposed to separate upper and lower deck passengers when alighting; in practice this didn’t work because most conductors thought that this handrail was for them to lean on. The rails were later removed. The Manchester buses did, in fact, have a specific place for the conductor to stand, a small section was "cut out" of the luggage shelf above the offside front wheel. The angled staircase also allowed space for a cutaway section in the rear wall of the cab, with a coat hook for the driver’s use. This avoided the perennial problem of coat sleeves flapping outside whenever the cab window was opened. At Rochdale in the mid seventies we had nine of these Fleetlines cascaded from Manchester, they were the best Fleetlines to work on, in my opinion. I wonder if these Tynemouth Fleetlines had these interior features? Tynemouth’s Fleetlines certainly didn’t have the 45° lower section of the staircase, the dividing rails or the cutaway section for the conductor to stand. I can’t recall a ‘wardrobe’ and coathook facility in the cab but I think that it would have been unlikely as I gather that it depended on the angled staircase to provide the space. I’m fascinated by this whole ‘Manchester-style’ platform arrangement and I wonder whether anyone has an interior photograph which shows it. Surely Don realises that all rails and stanchions on any bus were installed for the sole purpose of providing the conductor with something to lean against! What other possible function could they have been intended to fulfil? Particularly helpful designs often positioned additional rails so that the conductor could conveniently tuck his/her machine behind when not in use!